When the first commercial statin was FDA-approved in 1986 for the treatment of elevated cholesterol, researchers began to investigate what other effects the compound might have. For the past three years, researchers at Penn State Cancer Institute have continued their investigation into the effects of statins in the treatment of cancer, studying the use of the isoprenoid pathway modulators, which are responsible for the synthesis of cholesterol. Raymond J. Hohl, MD, PhD, director, Penn State Cancer Institute, and medicinal chemist Jeffrey D. Neighbors, PhD, assistant professor of pharmacology and medicine at Penn State College of Medicine, are currently engaged in multiple research efforts. One of these is a preclinical study funded by the Four Diamonds Foundation examining the smaller isoprenoid geranylgeranyl pyrophosphate (GGPP) synthase inhibitors as potential treatments for osteosarcoma, a pediatric cancer. 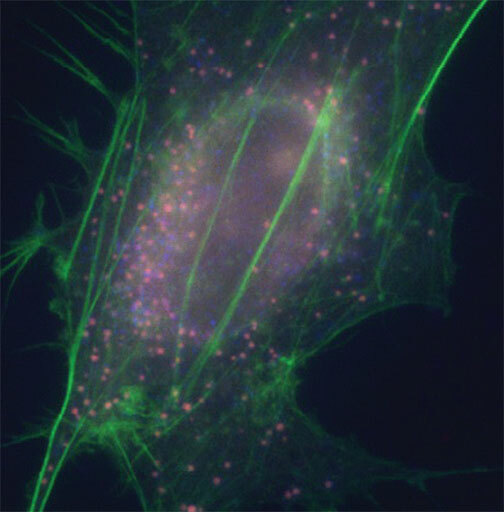 A) Fluorescence microscopy image showing cells treated with a fluorescent analogue of a novel cholesterol modulating drug, shows drug in green and cell nucleus in blue. The osteosarcoma study builds on Dr. Hohl and Dr. Neighbors’ previously published research on how metastatic potential for both breast and prostate cancer can be reduced with a statin. Additionally, Dr. Hohl and Dr. 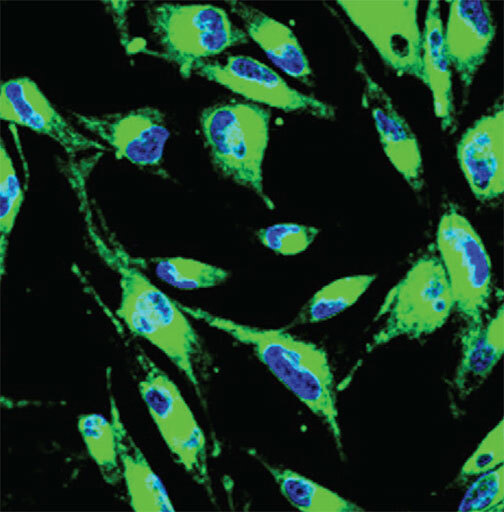 Neighbors have published a number of lab studies investigating the effects of statins on many different human cancers, such as leukemia cells. Research published in the British Journal of Haematology suggests that targeting the cholesterol pathway in combination with chemotherapy may improve efficacy without increasing toxicity in relapsed acute myeloid leukemia patients.1 The research being conducted by Dr. Hohl and Dr. Neighbors on leukemia cells has advanced to human studies, where researchers combined statins with cytosine arabinoside, a standard drug for the treatment of acute leukemia. B) Brain cancer cell treated with cholesterol modulating drug showing cellular compartment disruption and cytoskeletal changes. Scientists at the Cancer Institute are currently developing clinical trials for patients with a variety of cancers whose options with standard therapies have been exhausted. The purpose will be to examine the impact of statins and other agents that interfere with the cholesterol pathway in combination with chemotherapy drugs. Dr. Hohl explains, “We are trying to understand which patients and what cancers could benefit from this type of treatment. A lot of our research deals with the underlying molecular mechanisms of cancer. This research leads to our central question: what are the genetics of the different cancers? Why are some more responsive and others not?” Dr. Hohl believes that there could be numerous additional applications for this research, as scientists have found that many types of cancers are responsive to manipulating this pathway. “The cholesterol pathway is so important, and the fact that one can specifically target cancer cells rather than inadvertently targeting normal cells and causing unnecessary side effects is fairly remarkable,” says Dr. Hohl. Dr. Neighbors concurs, adding, “This is one of the frontiers in the cancer and cholesterol story. It’s an exciting time to be in the field.” The indications are strong that available cholesterol-modulating medications can play a significant role in potentially treating certain types of cancers in patients. FELLOWSHIP: Hematology/oncology, University of Chicago Medical Center, Chicago, Ill.
RESIDENCY: Internal medicine, University of Chicago Medical Center, Chicago, Ill.
MEDICAL SCHOOL: Rush University, Chicago, Ill.
Advani AS, McDonough S, Copelan E, Willman C, Mulford DA, List AF, et al. SWOG0919: A phase 2 study of idarubicin and cytarabine in combination with pravastatin for relapsed acute myeloid leukaemia. Br J Haematol. October 2014;167(2):233-237. Enter your email address to follow Penn State Cancer Report and receive notifications of new posts by email.